It's only a matter of time before some incident soils your carpet or area rug, and without the proper action, it could permanently leave a mark. Fortunately, it's easy to tackle those spills and keep them from becoming unsightly stains with a little knowledge and preparation. When accidents happen, they can leave unsightly stains on carpet and rugs. However, before you start cleaning any rugs or carpet, keep in mind these bits of advice to ensure the best care for your carpeting. First, know the specific care instructions that come with your rugs or carpet to ensure you perform the correct cleaning process. Next, test your cleaning solutions on a small, less noticeable spot on your rug or carpet to make sure they don't damage the material. Lastly, for extra-tough stains, or if you're unsure of a safe way to clean your carpet or rug, don't hesitate to call professional cleaners. The first step to successful carpet and rug cleaning is being able to react quickly to accidents. 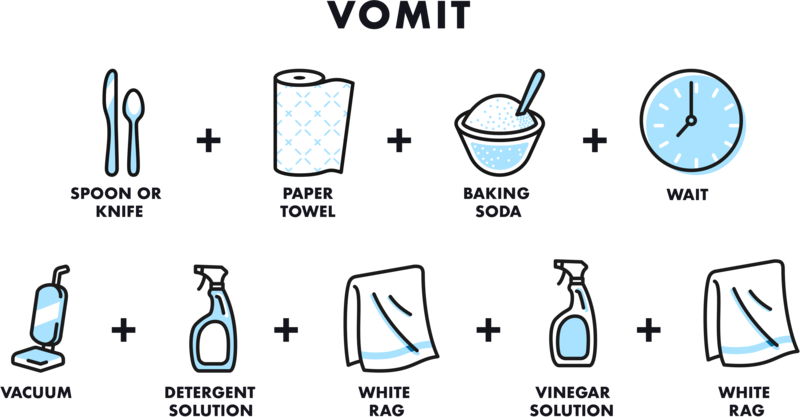 To help you tackle spills right when they happen, put together a stain removal kit that you can access quickly when your glass of wine tips over or when your pet just can't hold it any longer. Follow these recipes for DIY stain removers, put them in labeled spray bottles, and store them with paper towels and clean rags for your own homemade carpet-cleaning kit. 1. Dip a clean cloth in ice water and dab the stain starting from the edges. 2. Repeat step 1 until the stain has faded. 3. Spray the detergent solution on the stain until just damp and let it sit for 30 minutes. 4. Dab the stain with a clean rag. 5. Spray the ammonia solution on the stain until just damp. 6. Dab the spot dry with a clean rag. 1. Soak up as much spilled wine as you can with paper towels. 2. Spray the stain with the detergent solution and dab with a clean rag. 3. Spray the stain with the vinegar solution and dab with a clean rag. 4. Spray the stain with water until just damp and dab dry with a clean rag. 5. Repeat these steps as needed. 1. Clean up any solid materials and soak up excess liquid with paper towels. 2. Sprinkle the area with a generous amount of baking soda and wait 30 minutes. 4. Spray the stain with the detergent solution and dab dry with a clean rag. 5. Spray the stain with the vinegar solution and dab dry with a white rag. 1. Gently scrape up excess paint with a spoon or butter knife. 2. Dab the paint with a wet rag to clean up as much as possible. 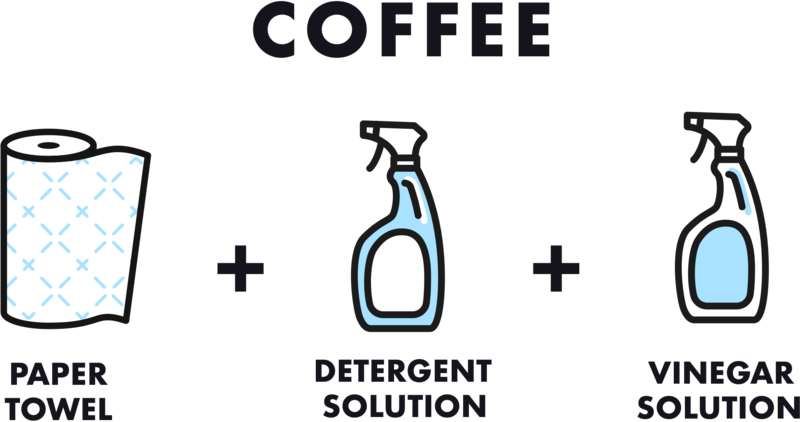 Use these steps to remove coffee from natural fibers such as cotton and wool. For synthetic fibers, only use the detergent solution after soaking up the stain. 1. Soak up excess liquid with paper towels. 2. Spray the detergent solution on the stain and dab dry with a clean rag. 3. Spray the vinegar solution on the stain and dab dry with a clean rag. Use these steps to remove pet stains from natural fibers such as cotton and wool. For synthetic fibers, only use the detergent solution after soaking up the stain. 3. Spray the ammonia solution on the stain and dab dry with a clean rag. 4. Spray the vinegar solution on the stain and dab dry with a clean rag. These steps are recommended to remove ink from natural fibers such as cotton and wool. These steps are recommended to remove grease from natural fibers such as cotton and wool.